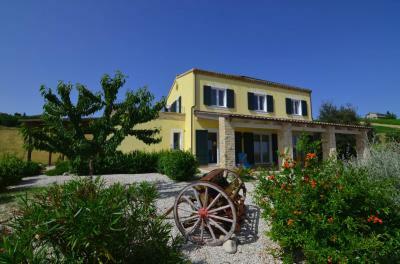 Would you like to live in Marche and having your own business by renting apartments? This is the right solution for you. 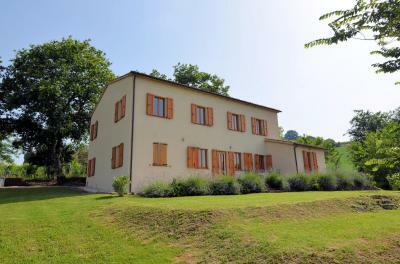 Property for Sale in the countryside of Penna San Giovanni, composed of main house and three guest apartments for rent, plus a swimming pool. Breathtaking view of the Sibillini Mountains. The property consists of a main villa of about 325 square meters, already renovated, dating back to 1900 in which has been created on the ground floor a delightful apartment for the owners with kitchen, living room, bathroom and two bedrooms, plus an outdoor area with pergola. The ground floor also has a storage area with summer kitchen and garden tools storage. On the first floor, there are two apartments, with independent entrance, both with kitchen, bathroom and double bedroom. The second floor is used as attic with spacious terrace. It's possible to create also a bathroom. Surely this space has a lot of potential. On 2016 the current owners have also renovated an old annex and converted into an additional nice apartment of about 50 sqm composed of kitchen, bathroom and two bedrooms, where you can admire a wonderful panorama of the Sibillini Mountains. The villa has a beautiful garden/land (approximately 6500 sqm), well cared for and maintained by the owners with many corners where you can enjoy the quiet, the silence and the amazing view. In the southern area has been built also a free- standing pool with wooden deck, parasols and sun beds. Really pleasant and relaxing. The property has all the comfort and services connected and then immediately usable. The villa is located a couple of kilometres from the historic centre of Penna San Giovanni where you can find all the primary services. Surely it is a starting point for exploring the many surrounding medieval villages such as; Gualdo, Sarnano, Falerone and Sant'Angelo in Pontano and other cultural historic sites. The beach of the Adriatic Sea is about 40 minutes drive away. Really a great chance to change your life style and enjoy the pleasures of Nature and culture of Marche Region.